Need Financing? We can Help! Ask us about Syncrony Financial Today! Since 1999, Glen Park Autoworks has proudly provided area motorists with a full scope of auto repair and maintenance services, all done at affordable prices. 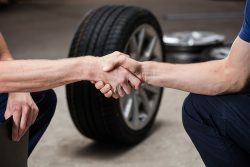 From brakes to tire inspection, we are your one-stop shop for complete auto care! Contact us today to schedule trustworthy, fast, reliable and quality service at the right price. Glen Park Autoworks is a U-haul dealer now. When you need auto repair in Gary, IN, the last thing you want is a hassle. At Glen Park Autoworks, we understand, which is why we make everything simple, fast and honest for our customers. We know you don’t have time to deal with the headaches of automotive repair, so we minimize all of the obstacles between you and a fully-functional vehicle. From upfront pricing and quotes, to fast turnarounds and reliable workmanship, you’ll get nothing less than the best from our auto repair experts! Plus, we can work on just about anything. Save Money – Check out Our Coupons! Perform scan test to retrieve trouble codes. Provide detailed description of each. Does not include repairs. Most vehicles. Not good with other offers. Other restrictions may apply. Visually inspect braking system. Most Vehicles. See store for details. Not valid with other offers/discounts. Radiator flush and fill, Standard oil change and battery test. Extended life coolant extra. Most vehicles. Offer valid at participating locations. Not valid with other offers. Other restrictions may apply. Supply fees additional. See center manager for details. Internet Special Includes up to 5 quarts of synthetic blend oil, new oil filter, plus vehicle maintenance inspection. Savings off regular menu price. Most Vehicles. See store for details. Not valid with other offers/discounts. Refer-A-Friend Discount Coupon. Get $10.00 off any service on your next visit when you refer a customer. Cannot be combined with any other offers or discounts. Must provide Referral details. As your complete auto repair shop in Gary, IN, Glen Park Autoworks is committed to getting you back on the road as quickly as possible. This means properly identifying auto problems, delivering the right repairs and ensuring every service we offer is done to the highest caliber. There’s a reason we’ve been the go-to auto shop for area customers for more than a decade. Schedule your next repair or maintenance appointment with us and let us show you why. Our mechanics are ASE Certified for quality, ensuring all work done on your vehicle is of the highest caliber. We’ve been a locally-owned and –operated auto repair shop since 1999 and take pride in serving our hometown customers! Our tailored approach to repairs means your vehicle is getting exactly what it needs to function again—not just a one-size solution. Our automotive expertise spans the gamut and reaches all major parts of your vehicle. We always offer free repair estimates, so you know upfront how much it’ll cost to service your vehicle. Whether you need brakes or ball joints, engine repair or exhaust service, our shop is ready to deliver exceptional workmanship. Contact us today to schedule a service appointment.